The Lindenwood Synchronized team after competition at the Palo Alto Acuatic Center in San Antonio, Texas. Photo provided by Marialaura Villasana. 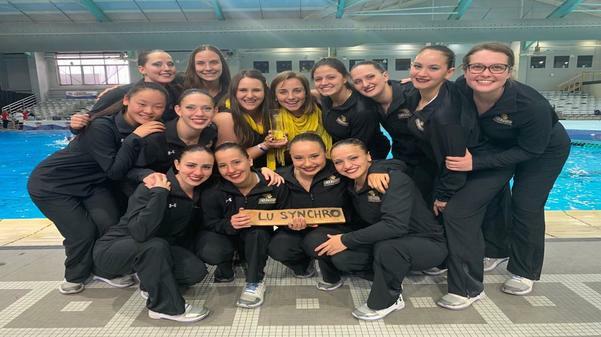 Lindenwood’s synchronized swimming team capped its season with a stellar performance at the 2019 U.S Collegiate Synchronized Swimming Championships. On March 27-30, the women’s synchro team successfully defended its elite top three ranking by finishing third overall, just two points ahead of the University of Incarnate Word at the Palo Alto Aquatic Center in San Antonio, Texas. The competition began with preliminaries of solo, duet and trio and all Lindenwood athletes qualified for finals. After the preliminaries, all twelve athletes competed as a team. Maria Lluc Bonnin, Maria Villasana and Kyra Hoevertsz took the gold with a combined score of 76.9751 for the A Element technical category, the first time in the history of the program. Villasana and Hoevertsz competed in the individual portion, earning a combined total of 17 points. After this event it all came down to the final event team to determine the final overall placement at the championships. The team gave a stellar performance and earned another 12 points to solidify third place. The winner of the championship was Ohio State University with 98 points, followed by Stanford University with 88 points.